So today is a mix of feelings. I’m am bummed about the Panthers game last night. Could that have been more embarrassing? I am bummed that funfetti week is coming to an end. It’s been so tasty! But! I am so excited to share with you the final funfetti recipe! 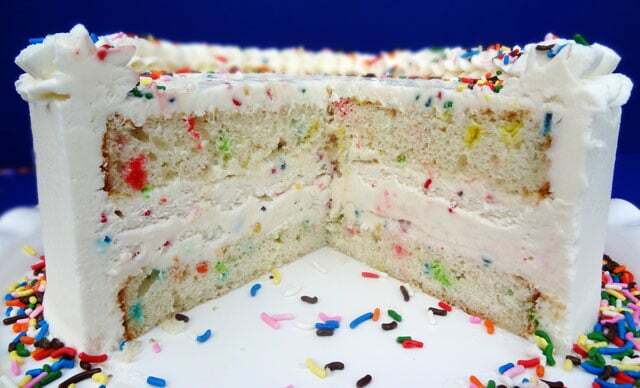 Funfetti Cake Batter Ice Cream Cake with Rainbow Chip Icing! But back to the cake. The Funfetti Ice Cream Pie was my hubs’ fave until I made this. This is just TOO AWESOME! I love it. It’s so pretty. I love the rainbow chip icing on top. It’s cheerful. Just like a funfetti cake should be. I actually am quite a fan of ice cream cakes. They have been my cake of choice for my birthday for many years now. You get regular cake at all kinds of occasions. And my dad’s always a sure thing for a good cookie cake. So I go with an ice cream one to round things out and mix it up. Besides, there are some seriously delicious ice cream cakes out there. This is clearly one of them. But for the last few years I have been getting the Birthday Cake Remix cake from Cold Stone. It rocks! It has all these amazing pieces of brownie in it too. Delish! You may be wondering why I don’t make my own birthday cake. Well, last year was the first year that I was actually making cakes, so that would have been the first time I’d have been able to. But here’s the problem. My birthday is on Christmas. Think about that for a second. No, my friends. It’s not cool. And here’s why. Don’t get me wrong, I love Jesus and I’m thrilled to celebrate his birth. I’m not knocking his day at all. It just overshadows mine, as would be expected. 2. I don’t want double presents. I want a special mid-year treat. 3. Birthday party? What birthday party?? Who would come? Aside from the immediate fam who I usually celebrate with (which I totally appreciate, love you guys!). Everyone is always focused on the holiday and going out of town. For example, most people have big 21st birthday celebrations. I was lucky to find one bar open on my birthday and manage to have my now husband and a friend there for a drink or two. And it’s not like we can have a party right after Christmas either. People are still out of town and by the time they get back, there’s another holiday. New Year’s Eve. And then guess what! Then my brother and my husband both have birthday’s in the first 2 weeks of January. I don’t stand a chance! And they kind of get screwed too. That’s why my ultimate goal is to not have a baby from the months of October to March. April through September are good. I am determined to not screw over my child. Nor do I want any more birthdays so close together! Do I sound bitter? Maybe a little? Sorry. It’s cool. Really. I’m used to it. But with all that goes on a Christmas, even I am busy and usually going out of town. Therefore, not much time to make myself a super awesome cake. I could probably make time, but then I’d stress out over it and it wouldn’t be worth it. By the time the last week or so before Christmas comes, I just want to relax and enjoy the season. Regardless of my birthday issues, it is my favorite holiday, hands down! 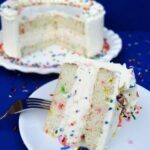 So, if you like ice cream cake and funfetti like I do, here’s an awesome recipe to help you combine them! Bake according to instructions on box. 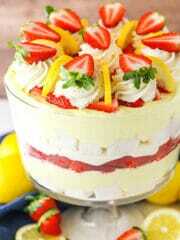 Make 2 layers of cake either 8 or 9 inches. 1. Mix cake mix and 6 tbsp of milk together. It will be thick. 2. 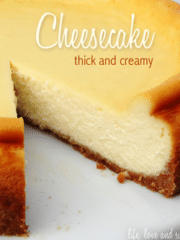 Mix the cream cheese, milk, cake mix mixture and sugar together with an electric mixer. Mix until smooth. 1. Beat butter and shortening until smooth. 2. Slowly add 2 cups of powdered sugar. 3. Add vanilla extract and mix. 4. 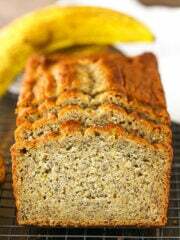 Add a tablespoon of water or milk and combine. 5. Add other 2 cups of powdered sugar and beat to combine. 6. Add more water until desired consistency is reached. 1. Use the same size pan that was used to make the funfetti cake. 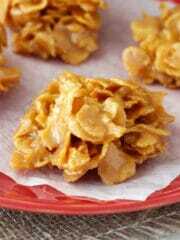 Put parchment paper in the bottom of the pan and around the sides. This will keep the cake from sticking to sides and allow you to be able to remove it when done. You could also use a springform pan. 2. 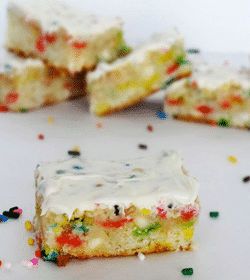 Put one layer of the funfetti cake into the bottom of your pan. 3. Add a filling layer of rainbow chip icing. 4. Add the ice cream. It’s best to make the ice cream right before you put the cake together so that it’s still soft and spreadable. 5. Add another filling layer of rainbow chip icing. 6. Add second layer of funfetti cake. 7. Freeze for several hours, until hard. 8. Add a layer of rainbow chip icing to the top of the cake. 9. Ice the sides of the cake with either American buttercream (as I did), whipped cream (for something lighter) or more rainbow chip icing. Reblogged this on Sassy and Classy. Hey since you have a Christmas birthday consider having a half year birthday party. That way you will still celebrate a true birthday not just Christmas. 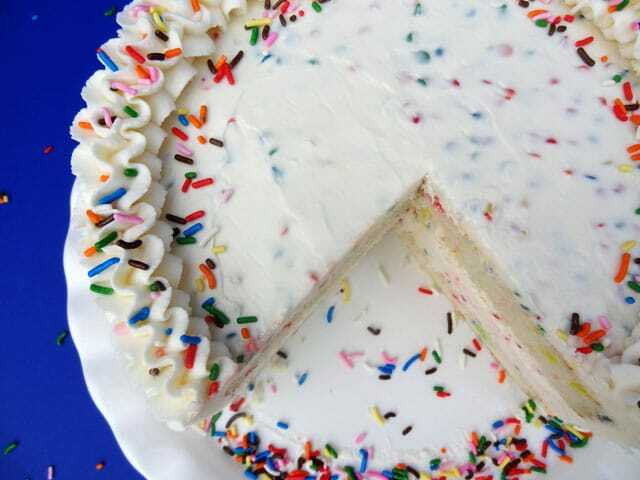 This cake is so pretty, I love the sprinkles. Your blog is so lovely, I’m going to subscribe! Is there any way to do this with less butter and shortening or at least without the shortening? Hi Sara! Yes, you can use all butter and no shortening in the icing, if you prefer. 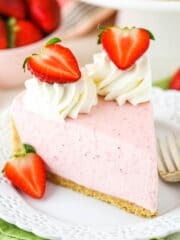 The other option is to not make the buttercream icing at all and instead ice the outside of the cake with whipped cream. I’m sorry it’s confusing Rebecca. You just want to gently mix the cool whip into the ice cream mixture with a spatula or spoon. 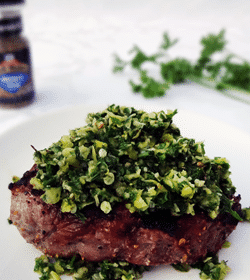 You don’t need to use the mixer to do it – it will over beat it. 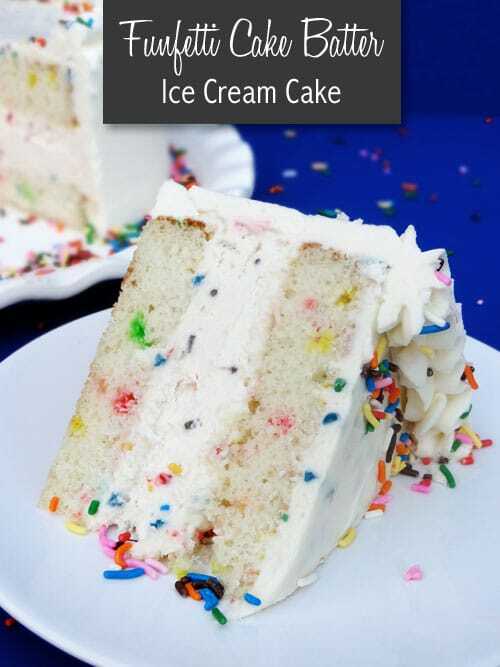 Im planning on making this cake tonight but I cant find rainbow chip icing at any of our local grocery stores…HELP!!! Hi Crystal, I sometimes have trouble finding it too. The one place I can always find it though is WalMart. What did they stop making? Do you use a separate box of cake mix for the ice cream part or take 1 and 3/4 cups of the cake mix from the raw cake mix before you bake? I’m sorry – I missed your question somehow. You will need 2 boxes of cake mix. I’ll make that more clear in the instructions. I made this cake for my husband’s birthday yesterday. It was delicious, however I was disappointed that the ” ice cream” layer never really froze completely. As a result, the top layer of cake had a tendency to squish down the “ice cream” layer whille frosting and resulted in more of a tire shape than a straight sided layer cake. Any thoughts? The rest of the items in my freezer stayed ice cold. Hmmm, I’m not sure. I’ve never had that problem. Usually I have to let mine thaw out a bit before cutting it because it freezes so firm. Did it freeze long enough? I usually let mine freeze overnight just to be sure. Just wanted to come back and let you know that freezing overnight vs for several hours seemed to do the trick. We are enjoying the leftovers now – by the next day the cake and center layer was rock hard. 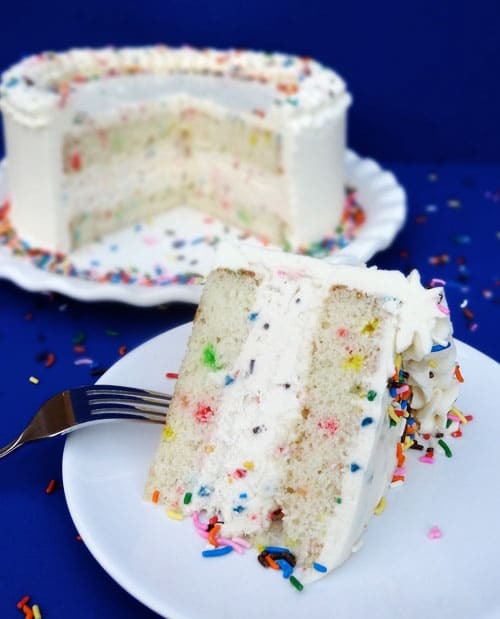 If you’re having trouble finding funfetti products, the cake mix is simply french vanilla (or white) plus rainbow sprinkles…the rainbow chip icing is white/vanilla icing with rainbow sprinkles or chips. Easy! A friend made this cake for her son’s bday and all he could say was “mmmmmmmmmmmmmm.” I’m thinking funfetti waffles, cookies, quick breads, scones…. Are you sure they discontinued it? I know it can be tough to find. I normally find it at Walmart. This cake has been in the freezer for three days. Looks amazing. How long should I defrost so its ready to cut? It should be fine if you set it out for about 30 minutes or so. Is the icecream batter supposed to be a little lumpy from the cream cheese? It can be a little lumpy sometimes, just get it as smooth as you can and it’ll be fine. What happens if you don’t put whip cream in with the ice cream? 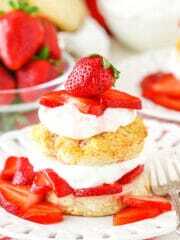 The whipped cream lightens it up and breaks up the cream cheese. I wouldn’t leave it out. Do you need an ice cream maker for this? No, it’s a no churn ice cream. 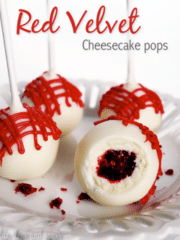 Just found this recipe and it looks AWESOME and so perfect for my niece’s birthday! Does the American buttercream stand up well to the freezer? My concern is that it will get hard or crumbly, and I plan to fill/ice my whole cake with it. Gosh it’s been so long since I made this cake, it’s hard to remember. 🙂 I think the buttercream gets pretty firm when frozen, but I don’t remember having issues with slicing the cake. Thanks for such a creative take on the ice cream cake! 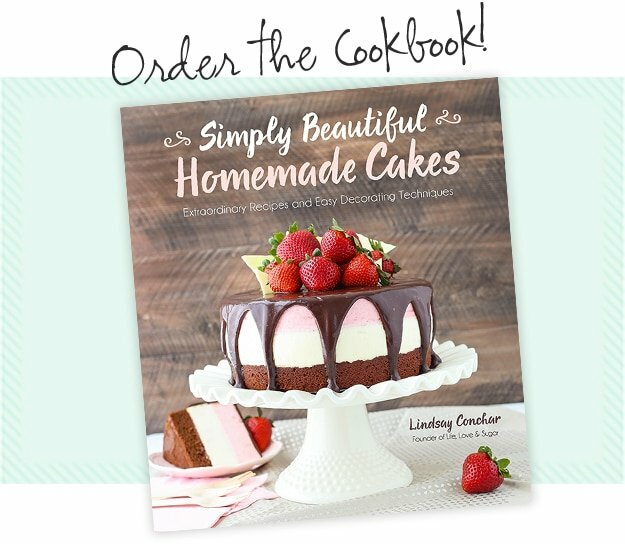 Quick question…the section titled “Filling and Icing” includes both the tub of funfetti icing and a recipe. 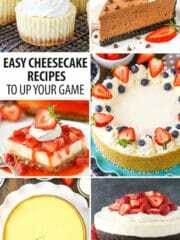 Am I to understand that the tub is used for the filing between layers and then the recipe is for the outside to frost the cake? Thanks for any help. Oh fun! I hope he enjoys it! I don’t think I mentioned it, so you didn’t miss it. 🙂 I used Ateco tip 844, but Wilton 1M should work similarly. I made this and it turned out perfect! Great directions. It was a huge hit and keeps really well. It’s been over a week since my husband’s bday and were still eating it! So glad to hear everyone enjoyed it! Thanks Kyndra! I’ll like to ask for the ice cream (cupcake mix) do we have any other replacement for that? Happy-Almost b-day. My son being born the day before Christmas Eve, and my father b-day is the day after Christmas…so I understand. My dad always had stories of getting “shafted” of course he has 15 brothers and sisters…he got a banana for several years in a row. So, I always try to put all the Christmas hustle aside, and make it special. Although, I’m always dying inside, because of all the things I should be doing (like wrapping presents). One of these years, I’m gonna get it together and start in October for this stuff. Like those really organized people do. Looks like a great cake! Can this be made 2 weeks in advance if kept in the freezer? I’m hoping that won’t affect the taste or the outcome. Thanks for your advice. It should be fine. I’d recommend making the main part of the cake and wrapping it really well before freezing, then doing the decor shortly before serving it. I’m not sure what pan to assemble this in. The same size pan I’d make the cakes in wouldn’t be tall enough to assemble all three layers. 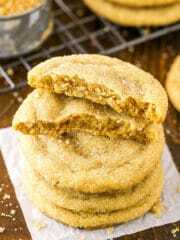 A great way to extend the sides of the pan so that you can build it is with parchment paper than creates kind of a mock collar, shown here. I hope that helps!